The global economy is expected to grow with low inflation in 2019. Watch Chief Economist John Greenwood give his macro-economic views. The value of investments and any income will fluctuate (this may partly be the result of exchange rate fluctuations) and investors may not get back the full amount invested. Where individuals or the business have expressed opinions, they are based on current market conditions, they may differ from those of other investment professionals and are subject to change without notice. This article is marketing material and is not intended as a recommendation to invest in any asset class, security or strategy. Regulatory requirements that require impartiality of investment/ investment strategy recommendations are therefore not applicable nor are any prohibitions to trade before publication. The information provided is for illustrative purposes only, it should not be relied upon as recommendations to buy or sell securities. Issued by Invesco Asset Management Limited, Perpetual Park, Perpetual Park Drive, Henley-on-Thames, Oxfordshire, RG9 1HH, UK. Authorised and regulated by the Financial Conduct Authority. 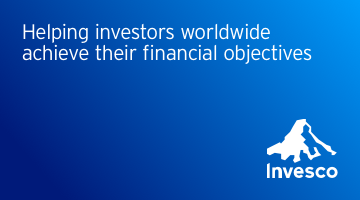 For more information or questions, visit invesco.com/us or contact your Invesco sales team. I think the likelihood of recession is pretty minimal. First of all, the kinds of factors we lump together as Jew political things like Brexit, the Italian debt crisis or Trump's trade wars are not in and off themselves enough to generate a global recession. Second, much is made of things like the Phillips curved, falling unemployment and rising wages, causing inflation or the yield curve becoming inverted. Neither of those two things, in my view is going to happen. And then finally what's really important is that the balance sheets of the major sectors in the U. S. Financial sector, the household sector to a lesser extent the Cooper sector are buying large in good shape and therefore the risk in the current environment is pretty minimal. This should enable the U. S to continue to grow and other economies to follow along path off the U. S I believe the current global expansion, Khun continue for several more years. First of all, balance sheets in most of the developed countries are much improved. Leverage has been reduced, and in addition, money and credit growth across the board are low and stable, which implies that inflation is going to remain subdued. And therefore central banks don't have to squeeze now, many people say. But that's all very well. The current expansion in the US and UK has already been going for nine years. Surely now it's time for downtown. But expansions do not die of old age. They only die when central banks squeeze now next June, this current expansion will exceed the longest expansion ever. That is ten years, I think, continue further. After all, when rates were normalized in nineteen, ninety four ninety five and two thousand four two thousand five, the business cycle continued to expand for several years thereafter. We're in that kind of normalization phase now, and growth can continue for several years after this current normalization is complete. Keeping the discussion to the U. S Federal Reserve system. The aim of policy is to raise rates to a level which will enable the economy to continue to expand had a normal sort of rate about two two percent real growth with roughly two percent inflation. They do not intend to squeeze the economy to such an extent that inflation is eliminated or that growth is terminated. On that basis, I think we can expect three or four more hikes during twenty, nineteen, twenty twenty. If you look at the dot plot of the FOMC, that's exactly what they specify. Of course, this is going to be data dependent, but I think that by and large the Fed will be successful in achieving a normalization of rates over the next two years. I don't think we should take emerging markets as a single homogeneous group. I preferred to split them into three distinct groups. There are those countries which have mismanaged their economies to an extreme countries like Venezuela, Argentina and Turkey. They will be undergoing long corrections. The second group, Our commodity producers, countries like Chile, Peru, Brazil, in South Africa. Now, although some of those are improving In a cyclical sense, commodity prices are likely to be very subdued, and so the normal sort of commodity boosts will not be available. Also, if the dollar continues to be strong, which I expect, that will be another road block, and then finally the third group are the manufacturing economy is mainly the smaller East Asian economies and Eastern Europe. Now, those air in good shape, but they can't move the dial on their own. They will depend on growth in the rest of the world, so that's the area to focus on rather than E EMS as a whole. I don't think that we will see the end of Brexit concerns or the Italian debt problems or Trump's trade wars in twenty nineteen, although some of those may be mollified or softened a bit. What really matters for investors, I think, is that the Fed rate hikes, which had been the other major irritant during twenty eighteen, will be coming to an end. And as investors start to perceive the end of rate hikes, even though some of those other geopolitical concerns are still on the horizon, I think that investors will start to take a much more benign outlook towards financial assets. Theo. How are UK smaller companies faring?